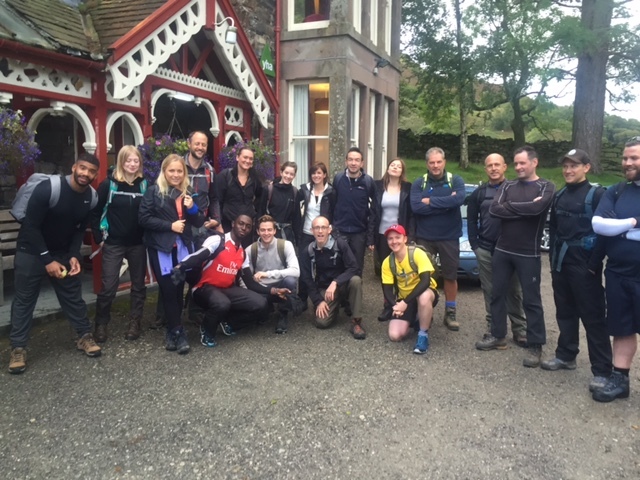 On Saturday 16th September, 21 sprightly members of the Lee & Thompson team gathered in the Lake District to undertake The Six Peaks Challenge in aid of the firm’s Charity of the Year, The Robes Project. ‘Sprightly’ is not a word that could be used to describe the team at the end of the day, but all 21 completed the challenge in one piece and the group managed to raise close to £6,500 for Robes. The Robes Project provides lifesaving shelter and a welcoming place for the homeless in Southward and Lambeth. As well as offering shelter, warmth and food, the charity works with guests on an individual level, helping them find stable accommodation and achieve their wider goals. With 28 venues and 1,000 volunteers, Robes is able to offer up to 5,000 bed spaces for 75 people each winter. £1,000 keeps one shelter running for a week so we are delighted that this challenge will have a real impact on people’s lives. The group took on the infamous Buttermere Horseshoe in a single day – a 14 mile hike with an overall ascent of 5,800 feet (that’s almost like climbing Mount Snowdon twice from sea level) stringing together 6 summits which curves around the head of the beautiful Buttermere valley. Led by Head of Dispute Resolution and climbing enthusiast, Andrew Forbes, the team included Reno Antoniades, Martyn Bailey, Sam Tatton-Brown, Kieran Jay, Dominic Bray, Malcolm Murray, Mark Stafford, Emma Teichmann, Simon Goodbody, Lale Kemal, Wayne Codogan, Alex Hazeldean, Michael Lucas, Fergus Carson-Williams, Brian McSharry, Frankie Miller, Lizzie Payne-James, Lucy Pether, Rose Laget and Poppy Evans. If you would like to support the team please click here.